Toshiba firmly believes that a single company cannot dominate any technology or business by itself. Toshiba’s approach is to develop synergistic relationships with different partners for different technologies. Strategic alliances form a key element of Toshiba’s corporate strategy. They helped the company to become one of the leading players in the global electronics industry. In early 1990s Toshiba signed a coproduction agreement for light bulb filaments with GE. Jack Welch, the legendary former CEO of GE, was a Toshiba’s admirer. According to him, a phone call to Japan was enough to sort out problems if and when they arise, in no time. Since then, Toshiba formed various partnerships, technology licensing agreements and joint ventures. Toshiba’s alliance partners include Apple Computers, Ericsson, GE, IBM, Microsoft, Motorola, National Semi Conductor, Samsung, Siemens, Sun Microsystems and Thomson. Toshiba formed an alliance with Apple Computer to develop multimedia computer products. Apple’s strength lay in software technology, while Toshiba contributed its manufacturing expertise. Toshiba created a similar tie-up with Microsoft for hand held computer systems. In semiconductors, Toshiba, IBM and Siemens came together to pool different types of skills. Toshiba was strong in etching, IBM in lithography and Siemens in engineering. The understanding among the partners was limited to research. For commercial production and marketing the partners decided to be on their own. In flash memory, Toshiba formed alliances with IBM and National Semi Conductor. Toshiba’s alliance with Motorola has helped it become a world leader in the production of memory chips. The tie-up with IBM has enabled Toshiba to become a world’s largest supplier of color flat panel displays for notebooks. Toshiba believes in a flexible approach because some tension is natural in business partnerships, some of which may also sour over time. Toshiba executives believe that the relationship between the company and its partner should be like friends, not like that of a married couple. 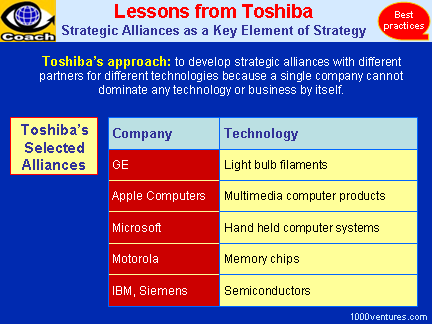 Toshiba senior management is often directly involved in the management of strategic alliances. This helps in building personal equations and resolving conflicts.